We finally managed to get an appointment with a doctor I often go to for minor events like muscle sprains, fevers, etc. He inspected my injury, gave me a tetanus shot and a few painkillers. I was okay with the tablets as they reduced the pain, but the head cramps and disorientation haunted me. The next day, my friend’s brother who happens to be an acclaimed cardiologist in Guwahati, insisted we visit Dr Shripad Pujari, a consultant neurologist in Pune. We reached his clinic at 6 pm and he checked me thoroughly, and suggested an immediate CT scan. He also prescribed painkillers and neuro-protectors. To me, this felt like the gloomiest day of my life. We went to the nearby Budhrani Hospital for the CT scan (where I have been treated before for a stomach ailment). The scan took barely 3 minutes and the reports were out in another 10. The radiologists, who saw my reports, told my friend that I had two cerebral hematomas. The advice was simple: see a neurologist ASAP. They checked my blood pressure first. 160, was the reading. The nurse checked my blood sugar again and then my haemoglobin levels. Sugar was 65 and Hb was 13.4. Next thing I know, there’s an IV needle inside my vein. I was given a very strong intravenous painkiller and some other drugs to stabilise my blood pressure. Due to the painkillers, I felt too weak to understand what was going on. I was shifted to a room on one of their floors. By then the medicines had reduced my pain a bit and I noticed that the room was neat and clean. The bed was comfortable. There was a little television set, an AC, attached western toilet with bath, a spacious balcony and a little bed for an attendant. The nurses were compassionate. 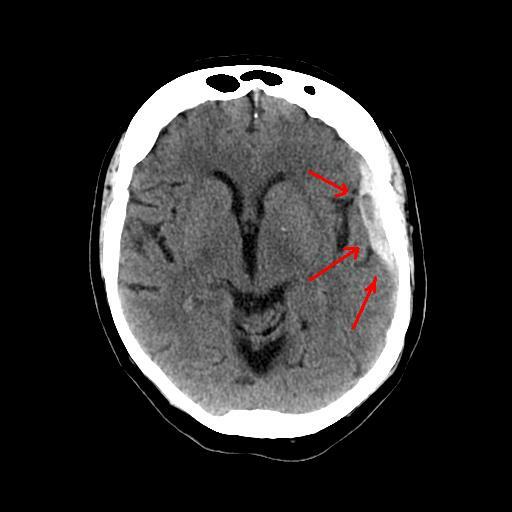 My diagnosis: cerebral hematoma, with cerebral haemorrhagic frontal and temporal contusion. My treatment included: IV after IV of medicines like manitol, dynapar, tramadol, clinaxon, pantocid and T. Nutam, and a constant monitoring of my vitals. It was a four-day treatment. I don’t have a very clear memory of my stay due to the constant pumping of medicines that made me drowsy. But whatever little that I can recall, I felt that the treatment I got was professional and the staff were pleasant. And that is the reason I decided to share my experience on Savetime blog so that other patients can benefit from it. I recommend Dr. Shripad Pujari, consulting neurophysician, MD (Medicine), DM, DNB (Neurology), MRCP (London), Clinical & Research Neurology (UK) for any neurological issues you or your loved ones may be going through. I recommend Noble Hospital, as it made my experience and treatment comfortable. They also have special meals for patients, freshly cooked in their canteen with less oil and salt. They have special security system for all visitors and have a canteen for them too. In fact, they have all-day room service room, which I found interesting for a hospital! All doctors and nurses were genuinely concerned, and gave personal attention. The preciousness of life comes from its uncertainty. If you ever hit your head badly, go for a CT scan right after the first aid. If you have local bleeding in head, Soframycin works the best to dry the wound. Consult the best neurologist you know in your city. Brain health is probably the most fragile and more important than we think. If you are a bike rider, ALWAYS wear a helmet. I am recovering now. I get mild headaches once in a while, which is normal for someone who’s got a contusion in the head. My tablets are still on, but my last follow-up report read I have almost recovered. This incident has grounded me forever. I learnt, although physical fitness is vital for good health, brain power is the all mighty controller of life. So, take good care of it. I sincerely wish you all a healthy, happy life.